The Mill City Farmers Market is only a few miles from our house, so I have been bicycling over there on Saturday mornings. 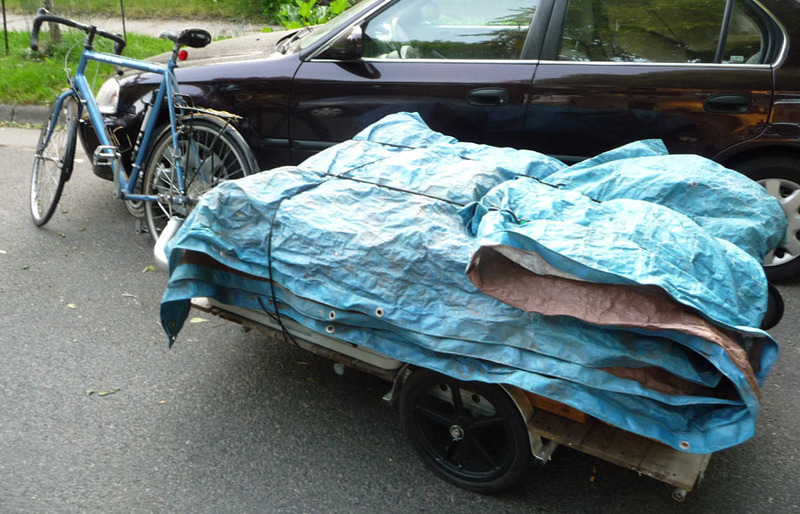 A friend is lending me his bike trailer, which is at least six foot long and has a capacity of 300 pounds. 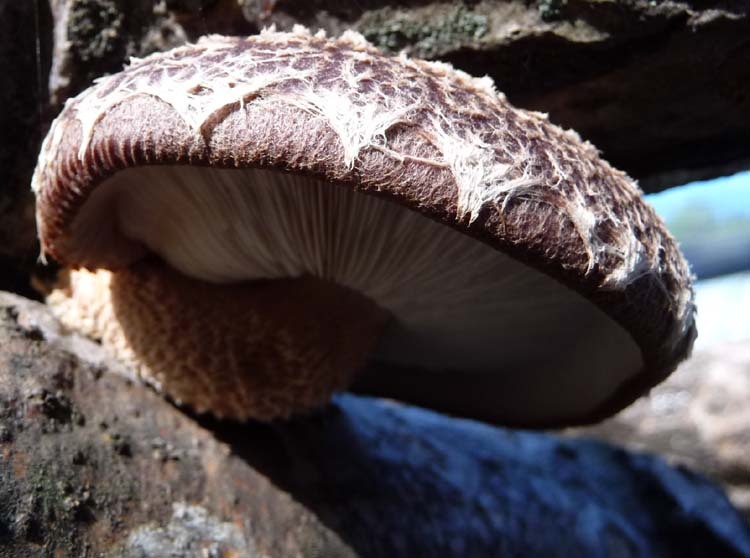 I am utilizing most of that, carrying fresh and dried mushrooms, mushroom log kits, table cloth, bags, and mushroom books. My friends at Stone’s Throw Urban Farm have been generous in bringing my tent and tent weights with them, weight that would most certainly put me over the edge. Even so, I avoid hills on the trip to and from the market! 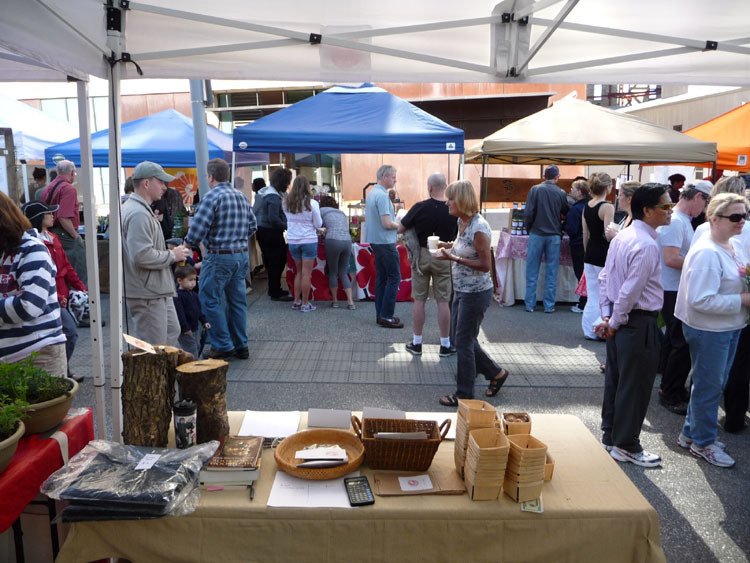 Here is my table at the Mill City Farmers Market, with log kits, shade tarps, books, dried mushrooms, and only a couple of fresh mushroom baskets. One of my most neglected tasks is managing the log stack environment. It is important to finesse humidity and air circulation in order to encourage growth of your mycelium while discouraging molds and competing fungi. Molds build up when you have too little air circulation and high humidity, and can inhibit mycelium and mushroom harvests. Mycelium thrives on the humidity, but it can tolerate more air movement than mold. 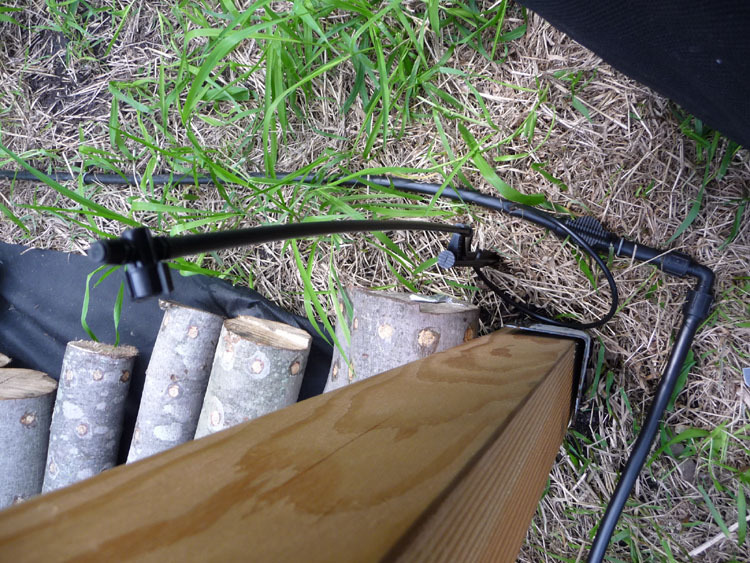 Hence my recent efforts to improve air movement in forest floor stacks (above) and shade structure stacks (below). For the latter I put down landscape fabric, since the grass is so vigorous. 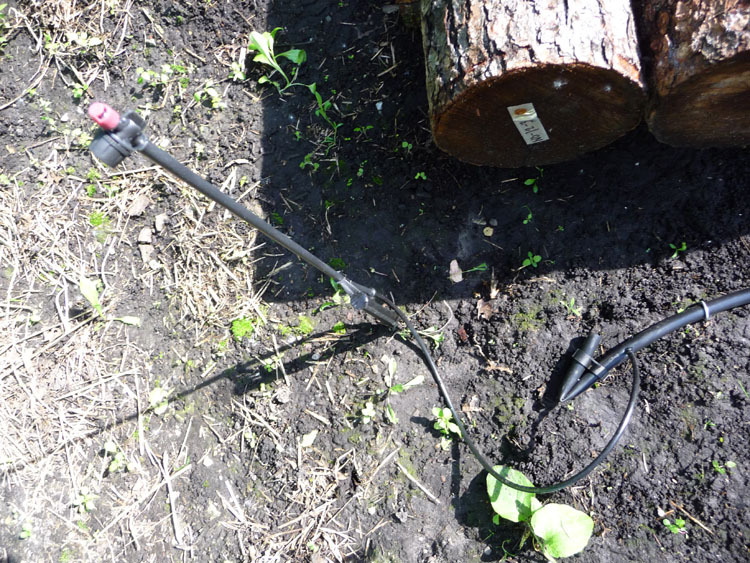 I’m hoping the forest plants will take longer to recover and I won’t need to do more than occasional pruning/weeding. How did I think to make these changes? Mold of course, which I found in sometimes generous swathes along the bark and sometimes at the log ends. 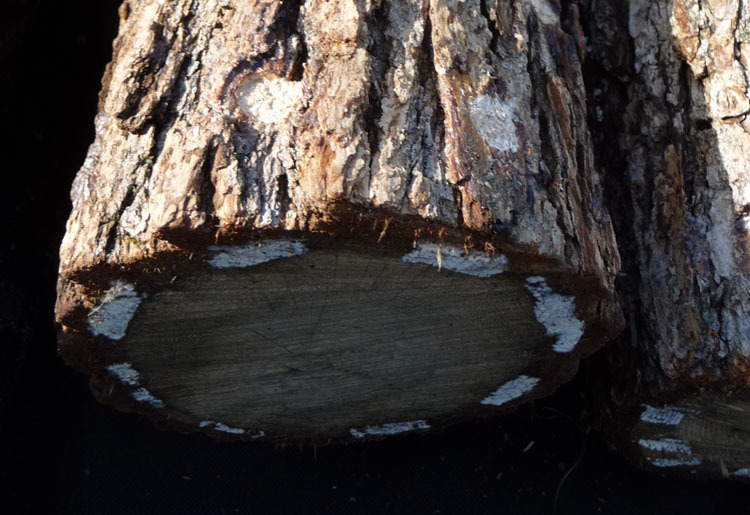 The good news is that most of it was white mold and that the mycelium also seems to be thriving, which I can see from the white sections on the log ends which line up to the inoculation points (below). I’ve found a few logs with blue/green mold, which is more malevalent. 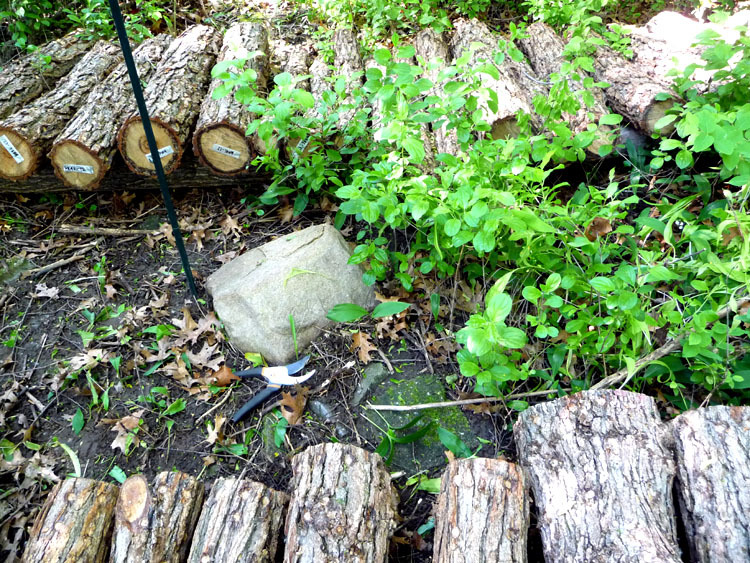 I try to isolate all moldy logs – since they bring up the mold counts for the laying area altogether – but I make a special effort with logs with blue/green mold. I have a “bad children” pile for this purpose that is a hundred feet or more from the other logs. 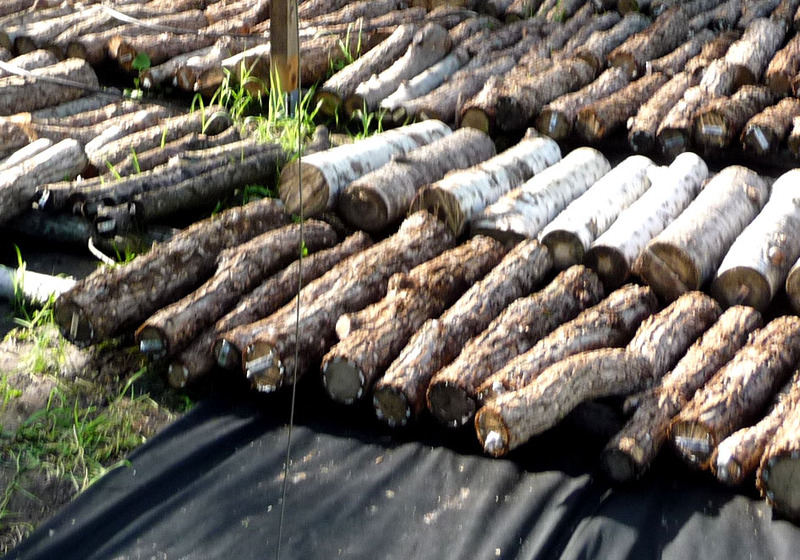 These moldy logs can still be quite productive, but they won’t infect the others. 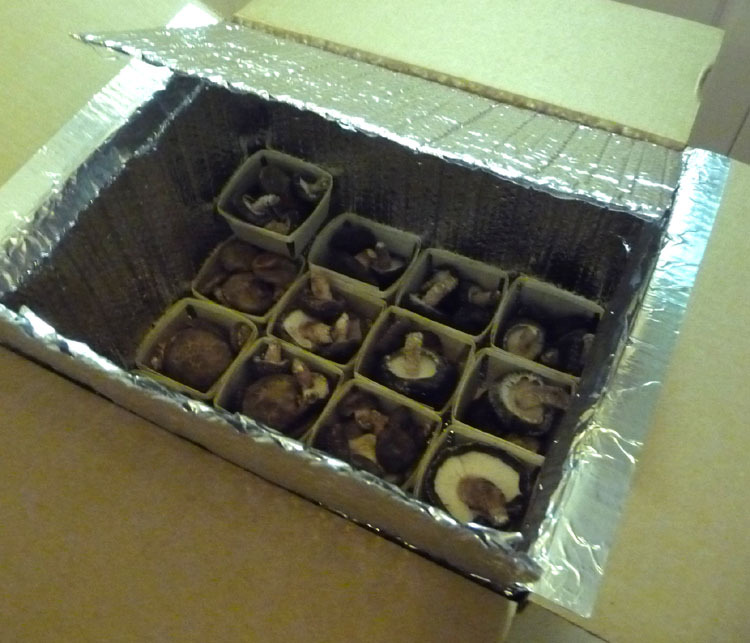 Last week I put together some “coolers” – boxes to keep mushrooms cool during the farmers market. 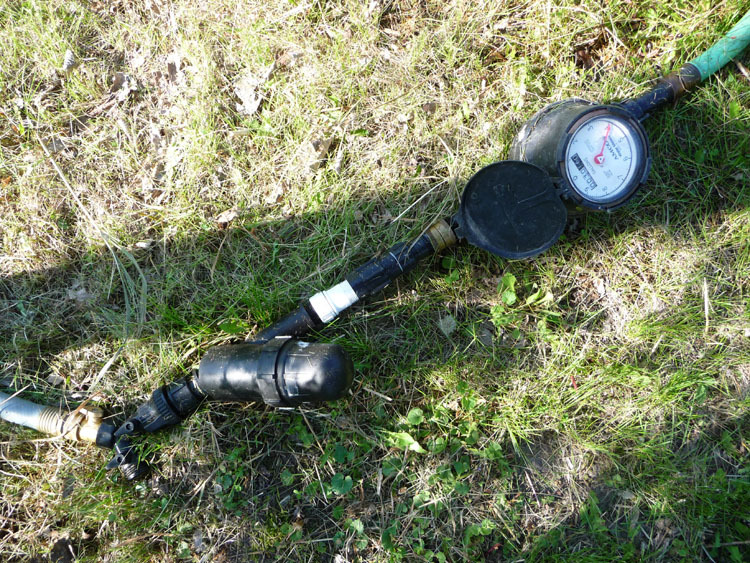 The idea came from mushroom farm and spawn supplier Field and Forest Products. I cut foil-backed bubble wrap to fit into a cardboard box, taped it in with foil tape and I was ready to add mushrooms and some ice packs on top. I used enclosed ice packs about the size and shape of ice cube trays – and they can be cut apart as needed. The ice packs sweat a little, so I kept a layer of paper bags between ice and mushrooms. However the whole setup performed admirably! 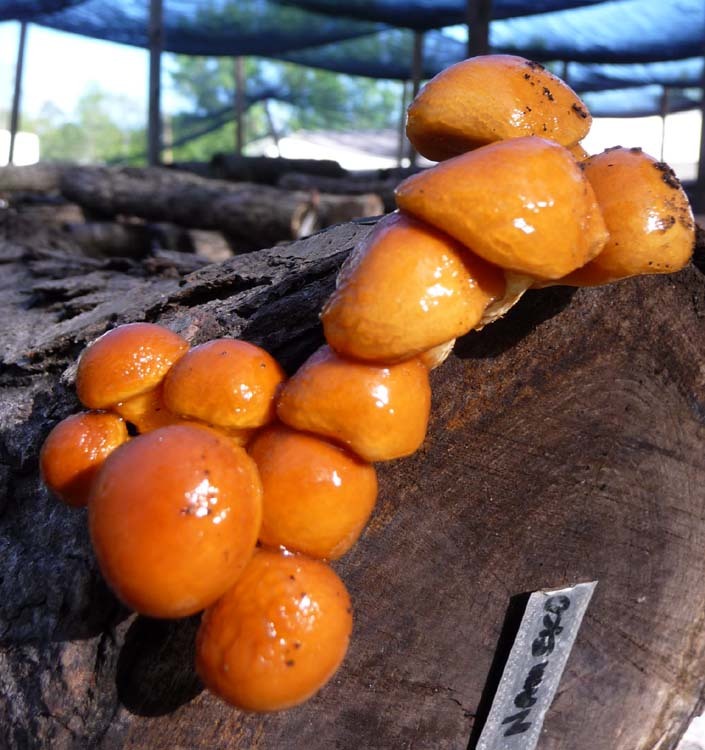 We have had a lot of rain fall in the last few weeks, and the mushrooms love it, especially the shiitake and nameko. 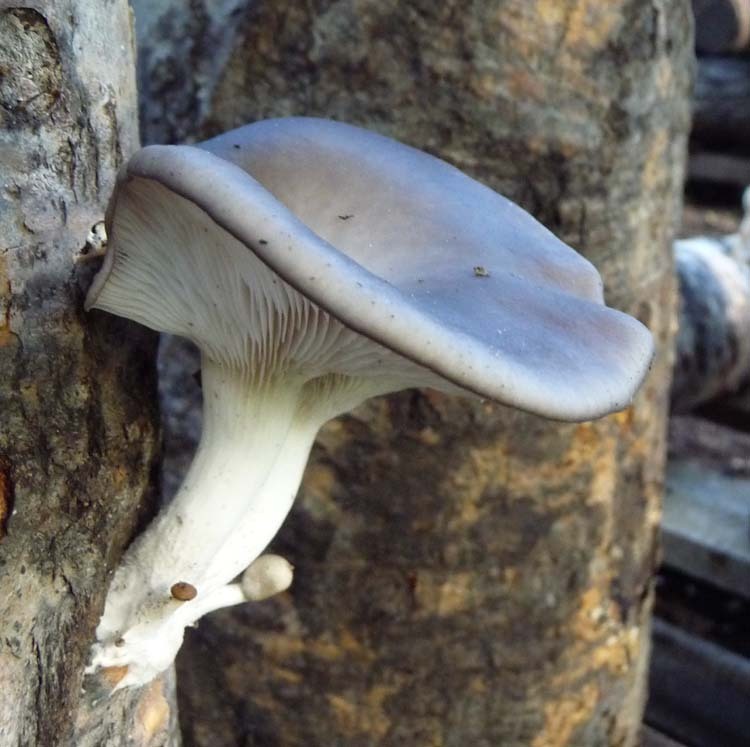 I have harvested a two or three dozen pounds of shiitake, while my few logs of Nameko are also doing well, and oysters have fruited a bit too, though its a bit too cold for them still. In general I’m appreciating the rain. and here are some Nameko fruiting on Cherry wood. The slimy texture doesn’t endear my wife to these mushrooms, but the slime goes away when you cook them, and they have a firm texture and a delicious cashew-like flavor.